Today, Humlegården is a green oasis at the edge of the densely built-up Östermalm area. It’s not the only park in the area, but it’s the largest by far and is enormously popular for slow strolls and picnics and birthday parties and sunbathing in the summer, sledding in the winter, and playground visits year round. Its position at the junction between Östermalm’s and Norrmalm’s street grids would lead one to think that the park was planned in as a green break between the two dense neighborhoods, but in fact, the park existed centuries before dense development reached so far. Today’s public park is a remnant of the once much larger private royal park. Humlegården translates as “Hops Farm.” Hops, the key ingredient in beer making, was in the late Middle Ages practically more valuable than gold. Sweden imported so much hops that a huge portion of the nation’s iron exports went to paying for hops (considering that Sweden was Europe’s largest iron exporter, this equated to a lot of hops (see Locks)). By 1442, farmers were required to pay their taxes to the Crown, 10% of their income, in hops. To further combat the need to import hops to the capitol, King Gustav II Adolf set aside a large parcel of land outside of the city for hops cultivation in 1619. This coincided with the conversion of the very central Kungsträdgården from a kitchen garden supporting the castle with vegetables, fruits and herbs to a royal pleasure park. In addition to hops, Humlegården also took over Kunsträdgården’s roll in providing the castle with fresh produce. It turned out that Stockholm’s climate is just a touch too cold to successfully grow hops. As the hops died out, Humlegården’s kitchen gardens took over larger areas of the farm. By the 1640’s, the farm had 709 apple trees, 494 cherry trees, 241 plum trees, 203 pear trees, and 320 damson trees. (Hops grows well just a bit inland, and Svarsjö and Ultuna became the new centers of royal hops cultivation.) Additionally, fields were converted into meadows for the grazing of royal livestock and barns were built to house the livestock over the winter. The farm was completely enclosed by wooden fences both to keep the riffraff out of the gardens and to keep the livestock from roaming. In 1648, Queen Kristina imported the French landscape architect André Mollet and charged him, among other royal projects, with turning Humlegården from a humble kitchen garden into a royal pleasure park. 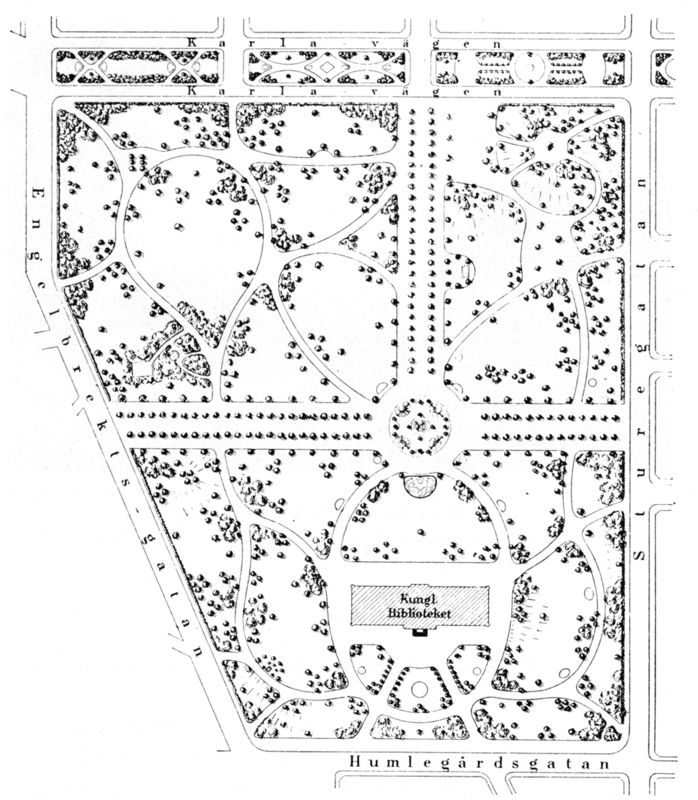 Mollet drew up plans for a fancy baroque garden, but I haven’t been able to find a copy of his original drawings. Only part of the garden was converted before Mollet left Sweden in 1653 and Kristina abdicated the throne in 1654, but Mollet’s radiating linden allés are still the dominant feature of the park today. For the next 50 years, Humlegården was a beloved outing for the Court. 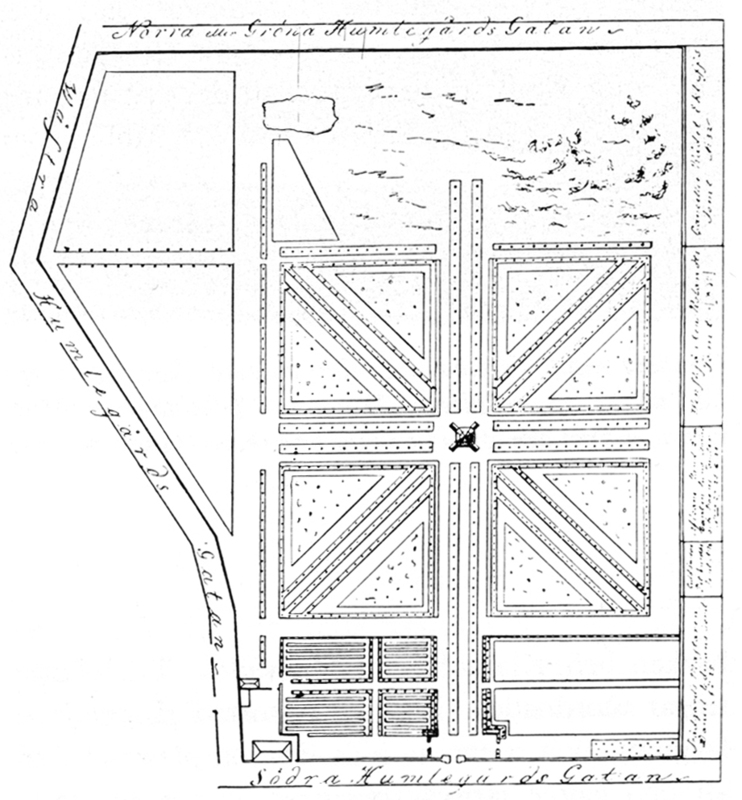 In 1686 Queen Ulrika Eleonora had a pavilion built at the center of the allé crossing, and she frequently took her children, including the future King, to play in the park. However, the park was largely ignored during the 1700’s due to a lack of funding for upkeep and a lack of interest from the monarchy. 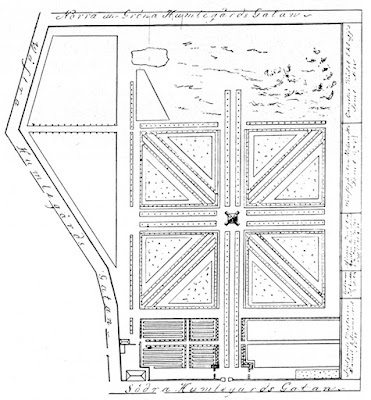 By 1763, it was decided to rent out the land to private entrepreneurs who were to maintain the park and keep it open to the public without an entrance fee. In return, the entrepreneurs could use the meadows for grazing of private livestock, sell the fruits and vegetables, and run entertainments such as a theatre, a carousel, a dancehall, and a café. Several businesspersons tried to make the arrangement profitable, but to no avail. There are still a couple of cafés on the edge of the park. 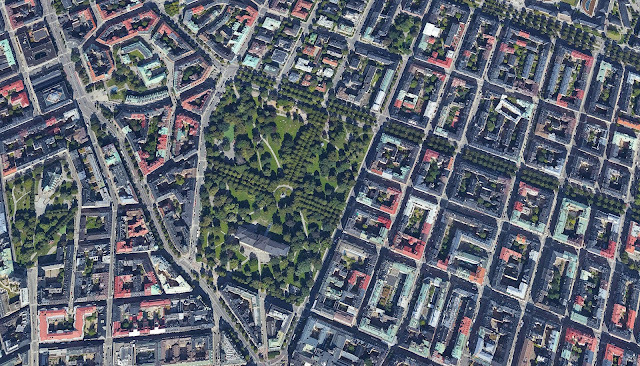 I find it surprising that the monarchy, despite a lack of interest and funding for the park, chose to hold onto this parcel of land while simultaneously donating large sections of Östermalm to the city to be developed into housing blocks. Why did the monarchy want to hold on to Humlegården when it was so expensive to maintain and so obviously hard for private leaseholders to make a profitable go of? Did the monarchy already foresee that this green space would eventually be needed in order to keep the densely built-up city humane and livable? 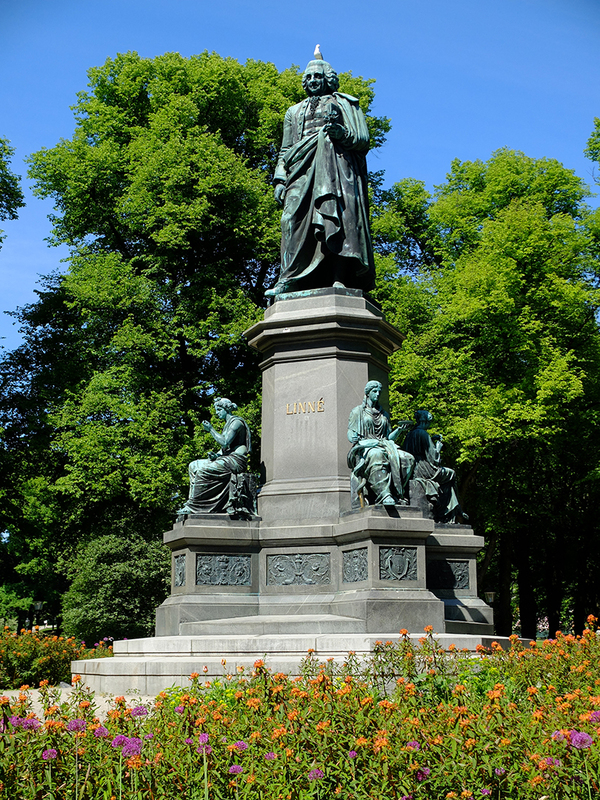 In 1837, the Linnésällskapet, a non-profit botanical organization, became the new caretakers of the park. 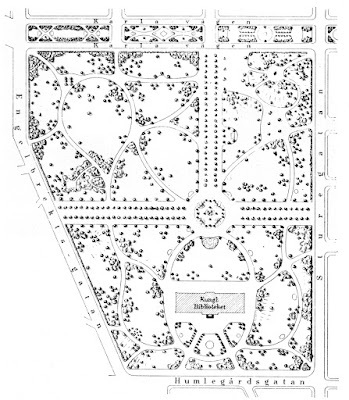 The northern part of the park was redesigned into an English garden with meandering paths and clusters of exotic trees, but four of the original eight Baroque linden allés were preserved thanks to the King who stopped the total destruction of the historic allés. The non-profit even operated a small zoo on the premises, but they, too, couldn’t make the park pay for itself, not least due to hooligans which constantly destroyed the park’s fences and stole animals from the zoo. Once it was opened to the public, Humlegården became a popular outing for the working class. These patrons couldn’t afford much in the way of refreshments and brought their own picnic baskets. As the park became more and more well-known as the haunt of the working class, those that could afford tickets to the entertainments and refreshments at the café stayed away. The park became more and more worn and dilapidated in a downward spiral. Soon, the park became the notorious haunt not of the working class, but of thieves and prostitutes. As development of Östermalm and Norrmalm marched closer and closer toward the park, it became clear that the lease-holding arrangement wasn’t working and that something must be done to correct Humlegården’s downward spiral. The solution was no half-measure. 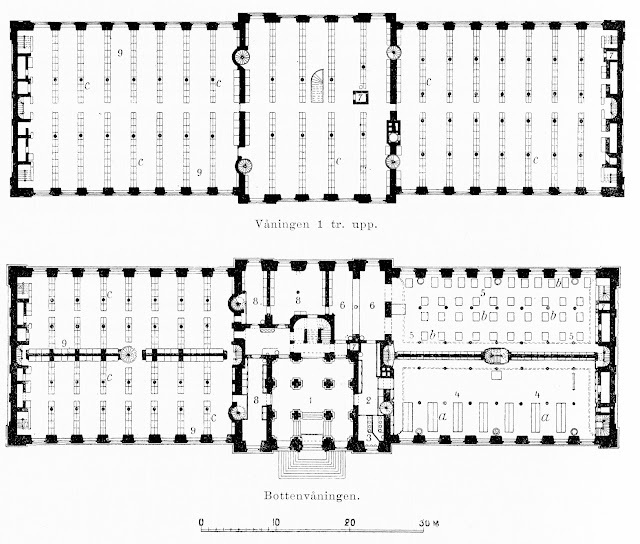 In 1869, it was decided that the Royal Library and Archive would be moved from the Stockholm Castle to a new building at the edge of Humlegården. This was very much in keeping with the era’s idea that intellectual activity is enhanced by nature, air, and light. 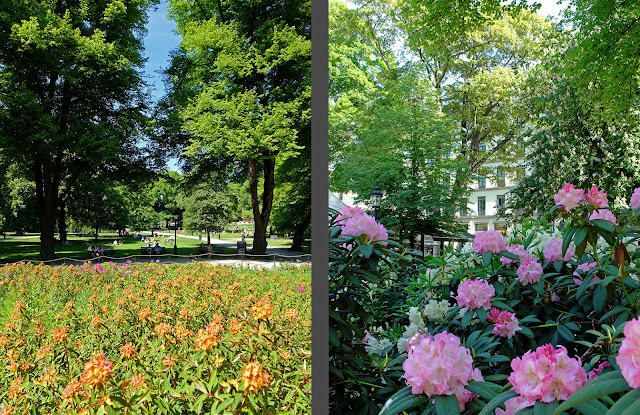 Humlegården became Stockholm’s first Institution Park, a trend which would continue for the next 50+ years. In addition, the State asked the City to take over park maintenance. The park was no longer required to pay for its own upkeep; now taxes could make up the difference. In 1877, the park was completely renovated. The general structure with curving Romantic paths between the three surviving Baroque allés was kept, but much of the vegetation was removed—both to eliminate hiding spots for petty criminals and to create open, sunny lawns which would be inviting to a broader cross-section of Stockholm’s population. 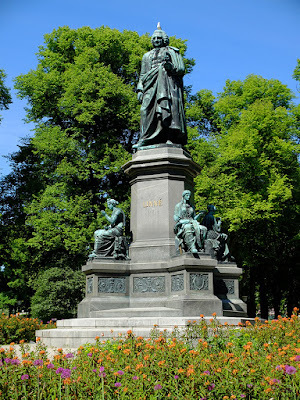 A large statue of Carl von Linné, Sweden’s beloved botanist from the 1700’s, was placed amidst flower beds at the crossing of the allés. The renovation had its intended effect and Humlegården became a popular place to promenade for respectable citizens. It was at about this time that the park was reduced to its current size when the tree-lined Karlavägen was built. Karlavägen has a linear park running down the middle of the street. South of Karlavägen, the city structure is a dense grid. North of Karlavägen, the block structure breaks up with large villas. It wasn’t until the 1920’s that a playground was built in the northern section of the park. The playground has grown over the last century and it is now one of Stockholm’s most popular playgrounds with specific areas dedicated to different age groups. Playground equipment, pavilions, and flower beds have all come and gone with the changing times over the decades, but today’s park is very much the same as the Humlegården of the 1880’s. The Royal Library serves much the same purpose as the Library of Congress in the U.S. as its archive holds a copy of every Swedish publication since 1661. In addition to books and periodicals, it also collects photographs, films, advertisements, music recordings, tv programs, etc. Even Swedish websites are archived in the library’s servers for future research purposes. Sweden’s monarchy has been collecting books since the 1500’s, but much of the original collection was lost when the Stockholm Castle, Tre Kronor or Three Crowns, burned in 1697. In an effort to save as much as possible, the librarians threw books from the fourth-story windows to the street below. Sadly, two-thirds of the collection burned, totaling 17,000 lost books and 1,000 lost letters. The library was eventually returned to the rebuilt castle but the collections ultimately outgrew the new space. 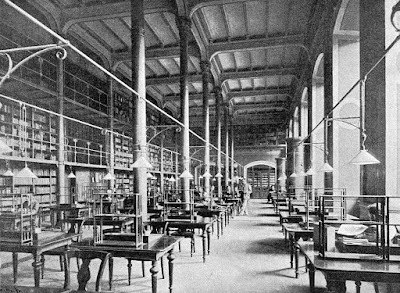 The library was moved to Humlegården partly to civilize the park and partly to provide a natural, open setting for research. The southern end of the park was dedicated to the library, and the southern linden allé was felled in order to make room for the new building. The building is on axis with the remaining northern allé and it sits on a slight artificially raised platform. The library was designed by architect Gustaf Dahl and the Classical, massive exterior hides an open and light interior supported by thin, cast-iron columns—Sweden’s first use of a cast-iron structure. In 1926, Axel Anderberg drew up an all but unnoticeable addition to the building, extending the sides with two pavilions. In 2014, the building was once again extended, but this time with vast underground spaces. It is worth noting that the majority of the collection is actually stored in off-site warehouses—researchers must request material to be moved to the library in advance. Humlegården has a long history as a royal farm, as a royal pleasure garden, as a public park descending into decay, as an Institutions Park, and now as a popular and beautiful public park enjoyed by the masses. These layers of history from the Baroque royal pleasure garden to the public English romantic garden are still visible in the park’s fabric today. The park is an interesting example of how an area, with enough effort and investment, can be completely turned around from a decayed pit of crime where no respectable citizen would dare go to a vibrant, posh park brimming with activity. The surrounding neighborhoods are indeed expensive and fashionable, and an address on Humlegården is nearly as attractive as an address on Strandvägen. While the addresses around the park are exclusive, the park provides an open public space where all walks of life can and do converge. That said, Humlegården shows that public investment is often needed to make successful public spaces. Private enterprise can be a contributing factor to success, but Humlegården shows that public investment is needed to keep public spaces functioning. Without public investment in the park, it is doubtful that it ever would have become a safe, vibrant space. 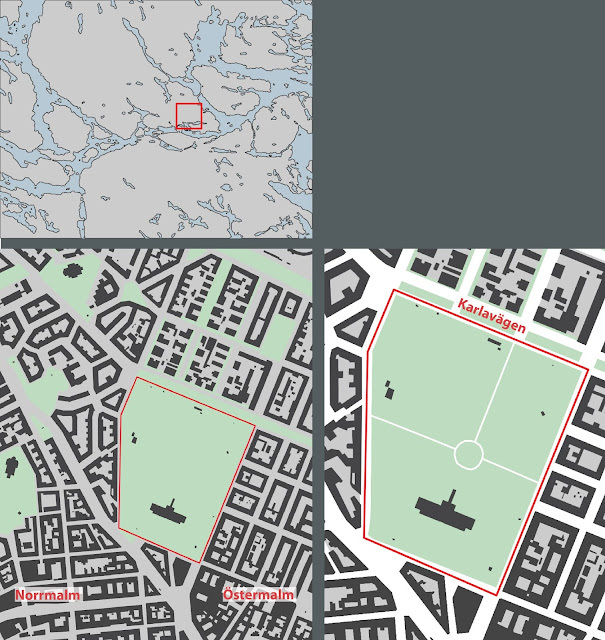 And without a safe, vibrant park in its midst, it’s doubtful that the Östermalm area could ever have become such a successful and desirable neighborhood. Bengt Edlund, Vårt gröna Stockholm Parker, parklekar, promenader och konst (2018). Bertil Asker, Stockholms parker innerstaden (1986). Kerstin Callert-Homgren and Margaretha Höglund, ed., Stockholm vår gröna stad (1998). Olof Hultin, Bengt oh Johansson, Johan Mårtelius and Rasmus Waern, The Complete Guide to Architecture in Stockholm (2009). * Bertil Asker, Stockholms parker innerstaden (1986).